In last weeks blog post about backdrafting water heaters, I mentioned that I might someday follow up with a blog post attempting to explain how to use section 501.3 of the Minnesota Mechanical Code (MMC), which is the code section that describes how to supply makeup air to dwellings. Well, there's no time like the present. This isn't the most exciting topic, but it's certainly a misunderstood topic. There's a general consensus among those 'in the know' that makeup air is needed any time a kitchen exhaust fan rated over 300 cfm is installed, however, that's not exactly true. The real requirement is that makeup air must be provided if it's needed. If an exhaust fan rated over 300 cfm is installed, makeup air might be needed and a calculation will need to be done. The Minnesota Mechanical Code is a combination of chapters 2 to 15 of the 2006 International Mechanical Code and Minnesota's amendments. The amendments can be found online here: https://www.revisor.mn.gov/rules/?id=1346 . Minnesota has amended section 501.3 in it's entirety, which means that this entire section is available online: https://www.revisor.mn.gov/rules/?id=1346.0501. Nice. The MMC has very specific language about makeup air that basically says makeup air must be installed when it's required, unless it's not required because of an exception. Yes, that's how code language is written. Clear as mud. To complete this calculation, you'll need to know the number and type of combustion appliances (power vent /direct vent / fan-assisted / atmospherically vented / solid fuel ), the conditioned floor area square footage, and the CFM rating of exhaust fans. Once all of these numbers are plugged into the table and a little math is done, the final number will be the amount of makeup air needed. If the number is negative, nothing has to be done. If the number is positive, table 501.3.2 determines how makeup air should be supplied. Footnote "K" at this table says that if flex duct is used (and flex duct is almost always used), the diameter of the makeup air duct needs to be increased by one inch. There are two exceptions to all of the above makeup air requirements. One is if a test is performed in accordance with ASTM Standard E1998-02, Standard Guide for Assessing Depressurization-Induced Backdrafting and Spillage from Vented Combustion Appliances, and it's proven that makeup air isn't needed. I don't know what those standards look like because I don't own them and I'm not going to buy them. The other exception is if a test is done that's approved by the building official which verifies proper operation of vented combustion appliances. Just for fun, lets go through a sample calculation. Lets say I have an old house in Minneapolis and I want to install a 600 cfm kitchen exhaust fan. 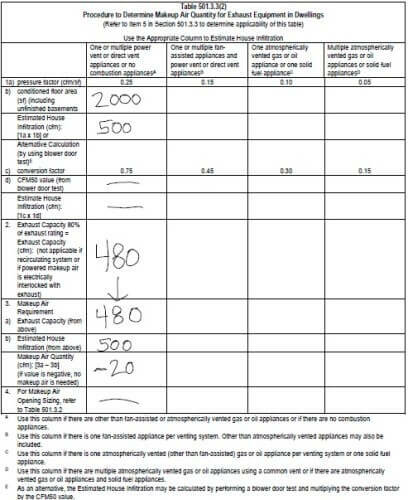 This is an exhaust system with a cfm rated greater than 300 cfm and the home was built before 1994, so I'll need to use table 501.3.3(2) to determine if makeup air is necessary. The house has a high efficiency, sealed combustion furnace, which is a 'direct vent' appliance. The water heater is a powervent, and the fireplace has a sealed combustion gas insert (direct vent). There is a total of 2,000 square feet of floor area in the house, which includes the unfinished basement. To start, I need to figure out which which column I'm working with. The first column on this table lists "one or multiple power vent or direct vent appliances or no combustion appliances." That's what I have, so I'll use this column. To determine the estimated house infiltration, I can either use the conditioned floor area or use the results from a blower door test. If extensive air sealing has been done on an old house it would be wise to use the results from a blower door test, but we'll use floor area instead to make it easy. Section 3 subtracts part 1 from part 2 (480-500), giving me a negative number. When the number is negative, no makeup air is required. So there you have it. Makeup air isn't always required when installing a big kitchen exhaust fan, but the calculation is always required. The calculations are shown below. On the other hand, lets say I'm working with the same house but I have an atmospherically vented water heater and a wood burning fireplace. In that case, I would need to use the column at the far right. Once I plug in all of the numbers, my makeup air quantity would be... 380 cfm. That's some serious makeup air. 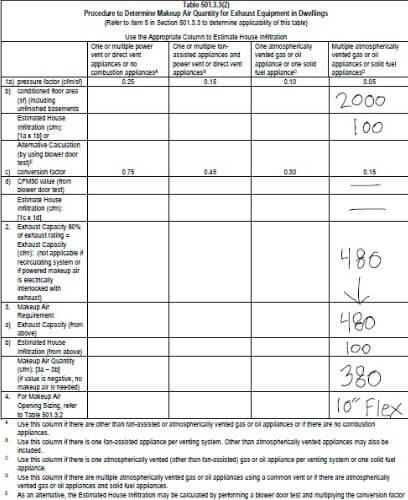 Next, I use table 501.3.2 to determine the size of my makeup air duct, which would be a 9" rigid duct with a motorized damper, or a 10" duct if I use flex material. In that case, a 600 cfm kitchen fan would just be a stupid choice, dontcha think? Hopefully I've taken a little mystery out of the makeup air requirements for Minnesota homes.